What does Jupiter in Virgo mean? These people are very particular about any task they take up and will complete it to perfection. Because of their attention to detail, the Virgo zodiac sign often excels at any new project they are given. 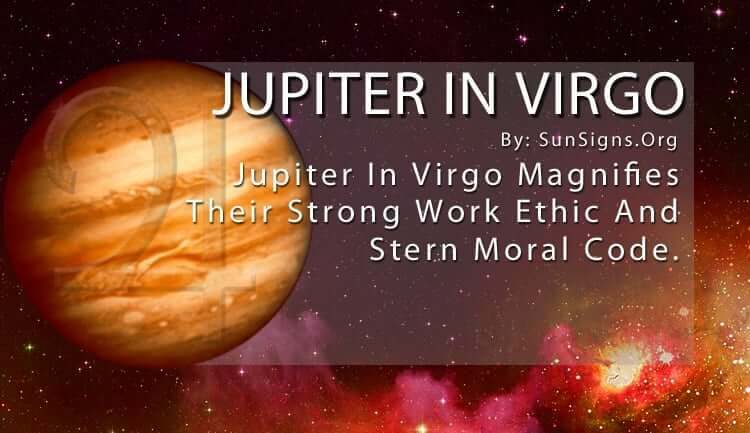 And Jupiter in Virgo magnifies their strong work ethic and stern moral code. They take things slow to get it right the first time. And, their perfectionism always gets them noticed and chosen again. Known for their analytical mind, Virgo makes their luck by taking on challenging tasks and solving complex problems. Their ability to deliver every time makes them a necessary commodity. With Jupiter in Virgo natal chart, they don’t back down from anything until the job is done. Jupiter is all about our values, the things that bring good fortune into our lives, and our travel preferences. Jupiter in Virgo likes to keep things as simple as possible. They like to cut down on any chaotic elements that could ruin their plan. And, they are willing to take on the tougher jobs to make sure they are done well. It’s that kind of can-do attitude paired with such high standards that attract good luck and good fortune. And they can maintain it with their practicality and persistence. They pride themselves on their rational thinking. It’s that kind of caution that gets results with minimum consequences. Virgos also value a good education and will strive to acquire as much knowledge about something before making a decision. This usually works in their favor when choosing the next opportunity. But they can sometimes miss big rewards by passing up a risky endeavor. The overly cautious nature of the Virgo Jupiter career doesn’t often allow them to grab life by the horns and shake every ounce of wealth and satisfaction out of it. But their reserved manner always works in a crisis. Their management of a tough situation only serves to bring in more practical career possibilities. Because they have such a tried and true method of getting things done, they can make others around them more efficient as well. And while some may feel Jupiter in Virgo can be overly critical. They are simply trying to improve whatever situation they are in, along with the other people involved. Their intent is always to be helpful, not hurtful. But because they are so hard on themselves with their perfectionist sensibilities, they tend to extend that same harsh judgment on others. And if they feel overwhelmed by all of the projects they have taken on, their observations can turn petty and annoying. As Jupiter in Virgo works so hard to be well-versed in whatever they are doing, their polished skill set consistently brings in more opportunities that keep them financially secure. You can’t pull anything over on a Virgo, so they are never taken in by frauds. And, their tastes are simple and refined. When it comes to Jupiter in Virgo money, they aren’t into lavish gifts. They value practicality over gaudy trinkets. And no one can get them to falter when it comes to their beliefs. Their sense of right and wrong is most often developed by an early age, although it may change slightly as they gain more experience. But Jupiter in Virgo knows who they are, and no one can get in the way of the hard work they put into every aspect of their life. Those closest to them understand the level of effort they extend for their loved ones, and they are sure to appreciate every detail.